Taking kids beyond their iPads and smartphones, the newly launched Girias Explorium is designed to develop overall cognitive and physical skills for all age groups. Touted as the city’s first childrena��s activity museum, the space is set in a 25,000 square-foot building and is divided into six galleries, which hold a total of over 75 hands-on activity a�?exhibitsa��. a�?Each exhibit will teach children about a certain educational concept. There is also a retail area a�� Explorium Toyworld, and a cafe, called Cafe Explorium by the Chancery,a�? informs Sarika Giria, director of Girias. Explorium Toyworld will stock a wide selection of educational playthings that are also fun, while the cafe will serve up kids-friendly food that include sandwiches, burgers, juices, ice creams and shakes. It was the lack of places to take her sons, Sahil and Aman, that led Sarika and her husband, Manish Giria to come up with the concept. a�?The boys wanted to go out to some place a�?new and funa�?, which led us to the concept of childrena��s museums in America, where kids could explore their potential and creativity. An immediate trip to the USA and visits to over 25 museums were made, as we realised that Bangalore was ready for its very own childrena��s museum,a�? shares Giria. While the designing and ideation started in July, the actual physical work started in October last year. Designed by Chicago-based Simon Lashford, with numerous other museums and theatre sets under his belt, the place has been divided into six zones a�� Explore, Splash, Build, Invent, Live and Create. With Explore, kids can climb a five-story structure, at Splash they can play with a water table, control its flow and understand the power of water and the energy it can create, and Invent sees little ones turn into amateur scientists with interactive experiences, where they can experiment with air, gravity, magnetism, velocity and force. At the Build area, children get to combine and rearrange various components to alter existing objects or create new ones through simple machines and tools, while at Live, they can hone their artistic side through role playing exercises, and Create offers them a chance to explore their creative side with art supplies across various media. 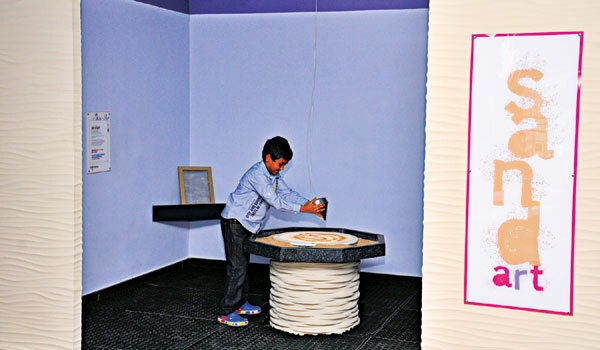 a�?The concept of the Explorium is to provide a hands-on learning space for children to play and interact with. Here, the children are not only playing and having fun but are also learning about educational concepts,a�? concludes Sarika.